When: Saturday, June 14. Noon. Requirements: Helmet is a must. All boards must not exceed 30 inches nose to tail. Trucks must be traditional (Indy style) cast trucks. 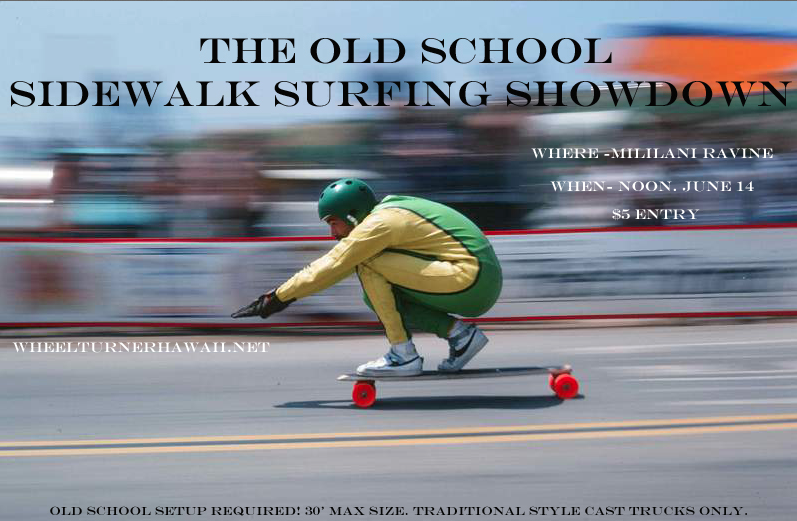 This event will be an Old School Sidewalk Surfing Challenge. All boards need to be under 30 inches from nose to tail completed with traditional CAST indy style trucks. There are no restrictions on wheels. You will also be required to draw two lines on your board a foot apart and a portion of each foot must be in the box at all times. The qualifying round for this event will be a solo time trial. You skate alone and pin the course as good as you can. Once we get our top 8 times it will be a head to head battle to the finish. See everyone on June 14 with your old school sidewalk surfing setups! A little while back the crew from Muir skate rolled over to Oahu for a quick get away and they were hyped on the island vibes. They went fishing, diving, SKY diving, hit some cool hikes and came out to session with the locals. Here's the edit they came out with from their trip. Im pretty sure we will be seeing them back next year!